Kyle Kashuv, left, receives the Gun Rights Defender of the Year Award from Alan Gottlieb, founder and executive vice president of the Second Amendment Foundation. 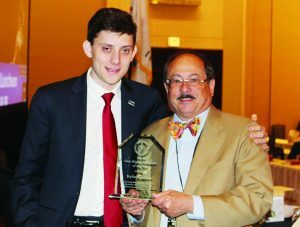 Following a short but stirring keynote address at the annual Gun Rights Policy Conference’s awards luncheon, Florida high school student Kyle Kashuv, a survivor of the deadly shooting at Marjory Stoneman Douglas High School in Parkland was honored with the Gun Rights Defender of the Year Award. It was the high point of the 90-minute awards luncheon, which also featured remarks by former MLB pitcher Curt Schilling, who this time was “pitching gun rights” to the packed room of Second Amendment activists. 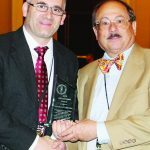 Joseph Greenlee, left, receives the Scholar of the Year Award from Alan Gottlieb. That may have been a slap at another teen from the same Florida high school who has become a national media darling by campaigning against the rights of tens of millions of gun owners. Kashuv said it is “understandable” that an immediate reaction to a school shooting is “an emotionally impaired response” to blame guns. President Dave Kopp accepts the Grassroots Organization of the Year award bestowed on the Arizona Citizens Defense League. 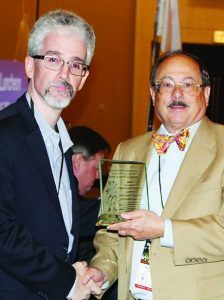 Attorney Mathew Goldstein, left, accepts the Bill of Rights award from Alan Gottlieb. In the end he encouraged the audience to fight for better security at schools. 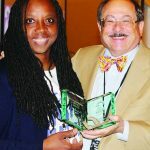 Stacy Washington receives the Journalist of the Year award from Alan Gottlieb. Schilling then observed that “I’m in a room with the most law-abiding citizens in this country.” He said the last time anyone heard of an NRA member being present at a mass shooting was an incident in Texas where an NRA member shot the mass shooter. 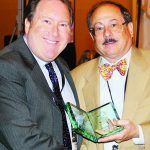 Rob Morse, left, receives the Ray Carter Blogger of the Year award from Alan Gottlieb. David Sigale, left, accepts the Defender of the Constitution award from Alan Gottlieb. Schilling also asserted that the Left is lying when liberals say they do not want to take anyone’s guns. He reminded the audience that gun owners are taking action, not by breaking the law but by working within the law. Schilling acknowledged that government appears to have lost control, with some people actively working against the administration and the people. And, he noted, people who are admitted socialists do not want the Second Amendment to survive. Richard Pearson, left, accepts the CCRKBA affiliate of the Year award presented to the Illinois State Rifle Association. For his work on the air defending the Second Amendment, Schilling was honored with the first-ever Gun Rights Hall of Fame award. The Scholar of the Year recipient was Joseph Greenlee, for his research and work on Second Amendment issues. The Journalist of the Year award went to Stacy Washington, whose participation in Second Amendment activities cost her media job. 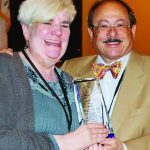 Rhonda Ezell accepts the Distinguished Service award from Alan Gottlieb. 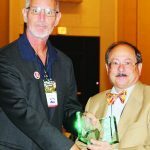 The prestigious Ray Carter Blogger of the Year award—named in honor of a Pacific Northwest gun rights activist and SAF employee who used social media to advance the cause of gun rights even while he was dying from cancer—went to Rob Morse, co-host and writer at the Polite Society Podcast. 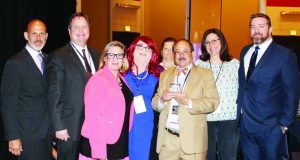 Illinois attorney David Sigale, who has represented SAF in several cases, was honored with the Defender of the Constitution award for his legal work on behalf of gun owners across the country. 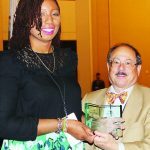 The Distinguished Service award went to Chicago resident Rhonda Ezell, who was also a plaintiff in a key SAF lawsuit against the Windy City. She has remained a Second Amendment activist and has inspired others to get involved as president of Chicago Guns Matter. 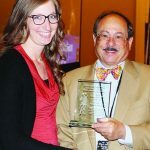 Rachel Malone accepts the Grassroots Activist of the Year award from Alan Gottlieb. The Grassroots Organization of the Year award went to the Arizona Citizens Defense League, whose president, Dave Kopp, accepted. 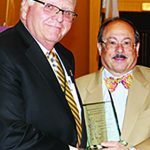 The Citizens Committee for the Right to Keep and Bear Arms’ State Affiliate of the Year award once again went to the Illinois State Rifle Association, which has captured the honor in ten of the past eleven years. Peggy Tartaro, editor of Woman & Guns for 30 years and a member of the CCRKBA board of directors, accepts the 2018 Lifetime Achievement award from Alan Gottlieb. Recognized as the Gun Rights Legislator of the Year was Rep. Thomas Massie (R-KY), who could not attend because of a scheduling conflict. Massie has been pushing national concealed carry reciprocity. 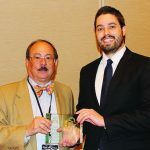 The Bill of Rights Award went to attorney Matthew Goldstein, who represents Defense Distributed in its legal travails with the government over publication of 3D printing technology. Walking away with the Lifetime Achievement Award was Peggy Tartaro, retiring editor of Women & Guns magazine and a long-time veteran of the gun rights effort. Defender of Liberty awards went to Yehuda Remer, Stephen Gutowski, Erin Pallette, Rob Pincus, Lara Smith, Laura Carno, Edwin Walker, Susan Lathrop and Brian Wrenn.